We study the rare gas cluster (Kr and Ne) containing 103 to 105 atoms per cluster, irradiated by an intense femtosecond laser pulse. The irradiation of these clusters with the intense laser leads to high excitation energy which is the source of the energetic electrons, high ion charge state and fragmentation process. We have used the modified nanoplasma model for the study of different mechanisms of ionization, expansion and explosion of the cluster. In this model, we consider a cluster with radius of few nanometers in a strong linearly polarized laser fields. The dimensions of the cluster are much smaller than the laser wavelength. The model treats all ionization processes, heating, electron emission and expansion process. We study in detail the different parameters of the nanoplasma leading to the final explosion of the cluster with and without Landau damping. 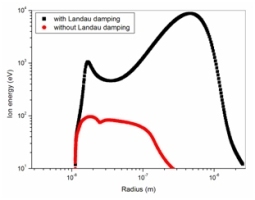 We have found that the hydrodynamic pressure increases 10 times of its value when adding the Landau damping term. We have also found ions with energy up to 9 keV.